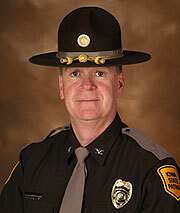 The Iowa State Patrol has a new leader. Iowa Department of Public Safety Commissioner Eugene Meyer announced Wednesday that the new Chief of the Iowa State Patrol is Patrick Hoye. Hoye assumes the duties of the office immediately, but will take the official oath of office at a ceremony in Des Moines next Tuesday. Colonel Hoye is a native of Storm Lake and currently resides in the Des Moines suburb of Pleasant Hill with his wife and two children. Hoye joined the Iowa State Patrol as a Trooper in 1982. He eventually was promoted to Sergeant, Lieutenant, and then Captain in 2004. Hoye is filling the position left vacant by Colonel Robert Garrison, who will become the Iowa Department of Corrections Chief of Security on December 14.